A term appropriate for gestational age, male baby admitted to our neonatal intensive care unit with vesicular rash with erythematous base on the face on day 5 of life. On the next day, his trunk and limbs were also involved [Figure 1]. His palms and soles were also involved. His weight was 2754 g. Baby also had respiratory distress. He was not maintaining saturation and required oxygen by hood. Mother had developed vesicular skin eruptions with severe pruritus suggestive of chicken pox 2 days prior to the delivery, which was clinically characteristic of varicella. Based on maternal history typical of chicken pox and the nature of rash on the baby, a diagnosis of neonatal varicella was made and the baby was kept on acyclovir and supportive therapy to which he responded and recovered. The presentation of the newborn, after intrauterine infection with varicella depends upon the time of onset of infection in the mother. 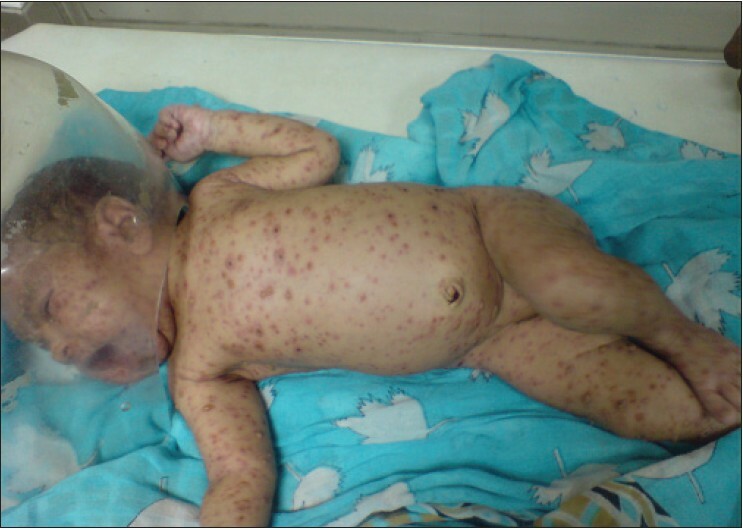 Varicella in neonates presents as congenital or neonatal varicella. Congenital varicella occurs if the mother gets the infection in the first trimester and the offspring presents with multiple anomalies. Congenital varicella syndrome has a poor prognosis with a mortality rate of around 30% in the first few months of life. , There are two presentations of neonatal varicella. If the mother is being infected within 5 days before to 2 days after delivery, varicella-associated antibodies are not transferred to the baby, thus the baby has develop severe infection. In second group, mother has the infection at least 5 days before delivery. In second group, adequate antibodies are transferred and the infection is less severe. Our case had a severe infection as the mother had developed rashes only 2 days prior to delivery. We are presenting the image of classical lesions of neonatal varicella. 1. Smith CK, Arvin AM. Varicella in the fetus and newborn. Semin Fetal Neonatal Med 2009;14:209-17. 2. Brunell PA. Varicella in pregnancy, the fetus, and the newborn: Problems in management. J Infect Dis 1992;166 Suppl 1:S42-7. 3. Lécuyer A, Levy C, Gaudelus J, Floret D, Soubeyrand B, Caulin E, et al. Hospitalization of newborns and young infants for chickenpox in France. Eur J Pediatr 2010;169:1293-7.